In recent months we haven’t had too good news about the new FC Krasnodar stadium. Four opening deadlines weren’t met, which resulted in the building still being closed, almost a year after it was first set for opening. But finally the wait is almost over as opening games have been confirmed. First, on October 9, Russia will play against Costa Rica. Being the host team of 2018 World Cup, Russians don’t have to qualify, so the game will only be a friendly. Then on October 20 FC Krasnodar will face Schalke 04 in the stadium’s first Europa League game. Pre-sale of tickets for that fixture will begin next week. The most expensive private stadium in Russia has reportedly cost over RUB 20 billion (currently $310 million), which is a very significant price for a stadium with 33,000+ capacity. 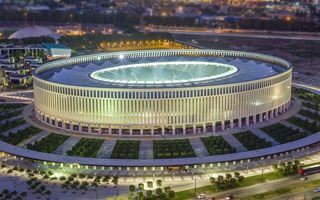 However, the new Krasnodar stadium is regarded as the most advanced in Russia with cooled/heated field, heated stands and a massive LED screen covering all of its internal walls.